“We have to manage Pertinax separately from the other three - Kiondo, Kivu and N’Dowe. The old boy has effectively gone into retirement.” It means some careful planning when it comes to providing access to their island playground and the use of the off-show and on-show areas of the Ape Centre. Pertinax was deposed from the position he’d held for nearly 20 years as the boss of the gorilla gang by the other three. In his time, he guided numerous feisty young gorillas to adulthood and saw them go on to join females and start families. He doesn’t know it, but he’s played his part in the international efforts to secure the future of his species. Now, as a senior with foot ulcers and intestinal issues, he’s taking it easy. Mammal keepers Anne Lunt and Gemma Keohane know him better than anyone. “He’s grumpy with strangers but he’s chilled with people he’s familiar with,” says Anne. “He likes what he knows – he’s set in his ways! But he definitely became much more relaxed and content once he was separated from the others.” There are parallels here with wild behaviours – alpha males are eventually defeated and replaced – it’s the way of the gorilla world. Pertinax arrived at Paignton Zoo to help start the group as a 16-year-old in 1997 and was the alpha male for the best part of two decades. 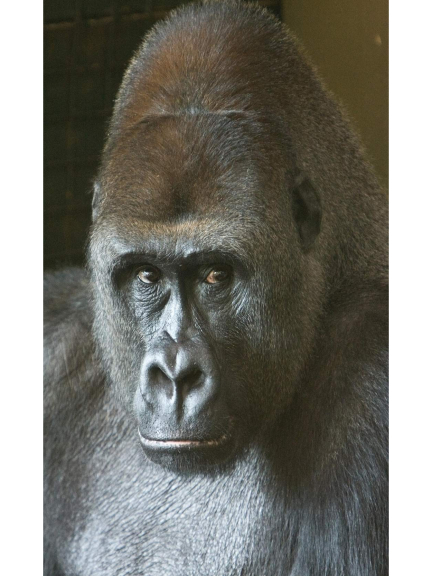 He’s been described as a very mellow, relaxed silverback and a great peacekeeper. He helped keep the group stable and teach youngsters how to be good, sociable gorillas – even if that meant the odd cuff round the ear! The charity’s bachelor group of Western lowland gorillas – a Critically Endangered species - plays a vital role in international gorilla conservation, providing somewhere for young males to grow up in a social environment. Some may move on to be the dominant males in bachelor or family groups in other collections as part of the European breeding programme. Nic again: “The dominance in the trio is fairly fluid as they’re still young silverbacks. They are yet to fully mature. Pertinax has been managed away from the others for a while. He is 36 now, and we would consider 40 or 50 to be a typical age for a male gorilla in a zoo. “He has a few health issues. He’s got bad feet, colitis and he’s not as active as he used to be.” Set in his ways? Health issues? He sounds like a lot of older guys… “He has a good life, and we’re always striving to make it better. For now, Pertinax’s health issues don’t cause him too much trouble – but we keep a close eye on the old boy.” Paignton Zoo Environmental Park is a registered charity. For more information go to www.paigntonzoo.org.uk or ring 01803 697500.